This simple classic dish, can be made in a million different ways, why in India itself there are many ways of creating this lip smacking delicacy. 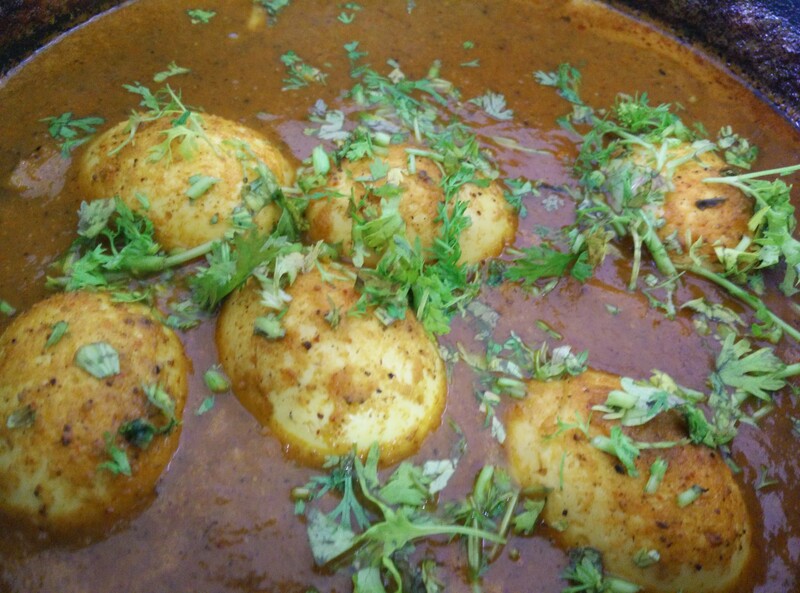 The Kerala Egg Curry is subtly spiced sauce made with coconut milk; the Mangalorean recipe calls for use of boiled eggs, coconut and red chilies; the Punjabi Egg Masala or anda curry is a spicy curry with boiled eggs,spices and cooked in onion, tomato gravy; the Kolhapuri egg curry has robust flavours and is made by grinding spices along with poppy seeds, the Shahi Egg Curry is rich and is made with cream and sprinkled with kasturi methi and the Gujarati egg curry…am joking most Gujarati’s stay away from all things non-vegetarian, unlike me. My recipe is a combination of flavours I have come to love and understand better over time. 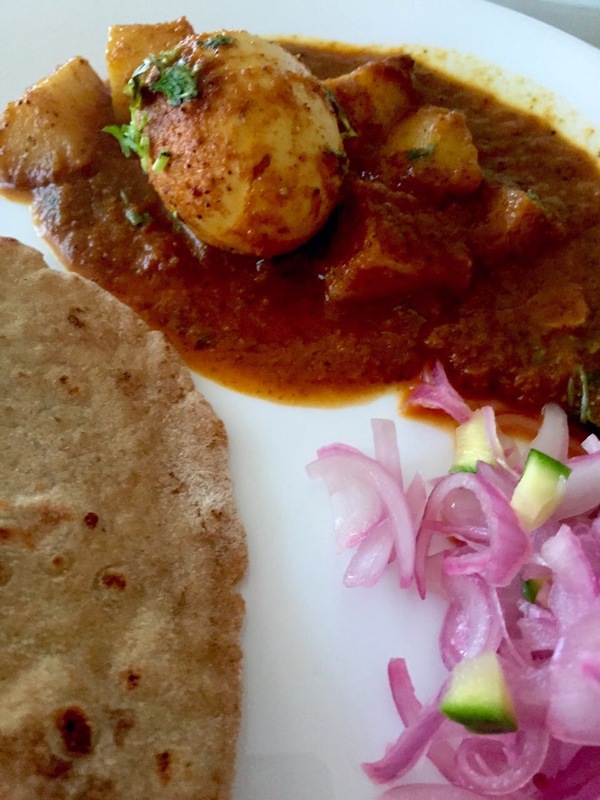 This is one of the simple go to dishes on a lazy day when the stomach craves for masala food, but the refrigerator has run out of its supply of richer proteins. The recipe does call for three important steps and is time-consuming, if you want to do it the traditional way. But I’ve included a short-cut method too. 1. 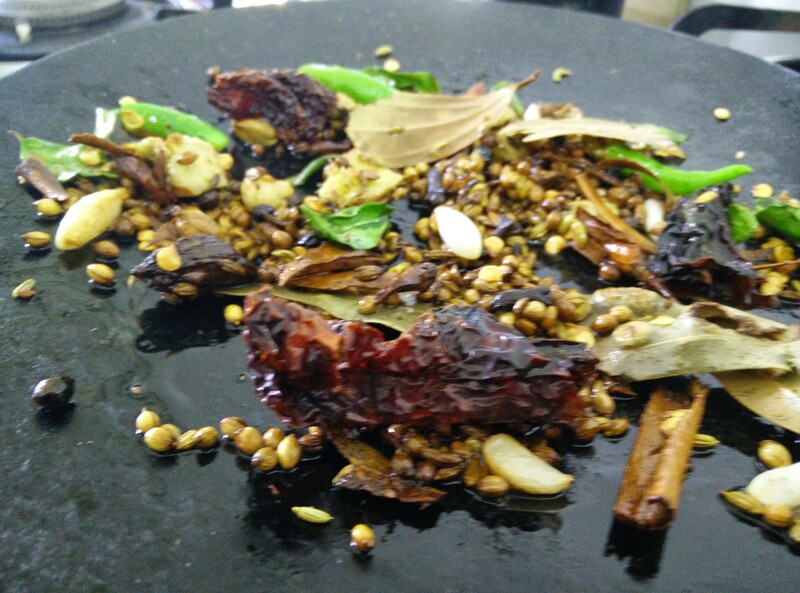 In a cast iron pan shallow fry the khada masala in oil. When the ingredients are well sauted, add the coconut and fry till golden. Let cook. Grind to a fine paste. I prefer to fry my onions and tomatoes separately, but feel free to put both into the pan together. However ensure you don’t over fry the tomatoes. 3. In a deep dish pan, add the ghee and butter, when blended, add the ground khada masala. Cook till the oil separates, now add the onion and tomato puree. Cook again till oil separates. Add the dry powders and cook for a minute or two. 4. Add 2 cups of water and let the mixture boil. Add the potatoes a this stage. And let the gravy boil till the potatoes absorb some flavour. 5. Prick the boiled eggs and immerse them in the gravy. Allow the gravy to boil for 10 minutes. Garnish with chopped coriander and serve hot with sliced onions and paratha.